Hum, there I am at #3, Anthropology. A Degree that I should not have bothered to earn. Okay, where to start? From the perspective of available jobs directly related to Anthropology … they are indeed scarce. Essentially they mostly are academic and those professors live forever. I witnessed this first hand at my college graduation. The undergrads and grad students for the Anthropology Department graduated together. I found out that none of the new PhD grads had a solid job offer yet. This is coming from UC Berkeley which is regarded to have the #1 grad program for Anthropology. Yet, I did graduate and got a job. Not as an anthropologist directly, but in Corporate America. To this day 25 years later, I do not regret receiving a degree in Anthropology. While not directly working as an Anthropologist, the education, experience and most importantly, the world view gained from my education is priceless. I have written before about how my Anthropology education serves me well in my business / leadership life. I am a believer in encouraging college students to follow their passion in their studies. In many respects, an education is an education and so much is transferable to a variety of work pursuits. I am living this now with a daughter studying conceptual art in college and a son off to college next year with a love of history. So many people I have interviewed for jobs have standard college business degrees. From my experience the best business degree is the actual work in business. Somehow the classroom does not fully translate. The best business “professors” have been the many managers I have worked for. Nothing wrong necessarily with a business degree, but what else did these folks study in college? Where was the intellectual curiosity, the passion? I do not want to live in a world where everyone has a business degree or a computer science degree. As employers it is up to us to do a complete job of selecting job candidates. Give me a smart person with energy, curiosity and some depth. From there the real education can begin. Studying primate behavior has really helped life in Corporate America. An Anthropology degree indeed. All the best – Michael. I only wish all recruiters could be as open-minded as you are! Thanks for the visit. I also find that many recruiters look for reasons to not talk to someone than to find a reason to bring them in for an interview. As someone with a music degree from Oxford and an organ scholarship, who went and joined a brewery, I wholeheartedly agree! It can be argued that very few people with an Arts degree go on to use their knowledge per se in their career. Recruiters are looking for the intellect, not the knowledge (or at least they should be). My brother in law was with me in College studying Classics (surely knowing Greek Syntax is far more useless than Anthropology?). He did nothing for 3 years, crammed in his last year and did some statistcial analysis to predict what questions would come up, and got his degree. Now CEO of Unilever Asia. Thanks Michael. Thanks for sharing. It is up to us to us to spread the good word on the power of a broad education. To think I was almost an Art History major. I am not sure where that would sit on the hierarchy. Well, first you have to figure out what field of ahlgropotony you want to master in. Junior colleges generally offer the basic ahlgropotony classes. I advise taking those before you decide if you want to go into the field.As another poster said, it is incredibly competitive, so getting good grades (the top of your class), knowing your teachers, etc is the best way to get a job (like it is any degree).There are numerous types of jobs available to someone who masters in ahlgropotony. Teaching, field work, etc are just a few. If you want to know more, talk to a teacher, they should have real experiences that would take a while to type out online.Anthropology is more of a passion, than making money. I’m not saying you lose money doing it, but it is time consuming. Some work 24 hour shifts, and some work from 6am 11pm depending on the field. Expect any artistic ability you possess, to be minimalized, as you are now basing everything you work with, off of logic and understanding what is put in front of you. Previous friends may not enjoy your company anymore, because of your unique look on life, and because half the time you talk, you make no sense.Be prepared, that some religious beliefs may not work with this field as it is a science that, generally, involves evolution and questions a lot of moral beliefs. Was this answer helpful? I just read and addressed a similar article but instead Anthropology was number 1. I am a senior looking forward to grad school and reading such a thing was discouraging. However, I tell people all the time that an anthropology degree is very useful. With this degree I can get a corporate job very easily. Loved the post! Thanks for the visit and comment. I just read your blog – good stuff and keep it up. I will be reading. All the best in your career. 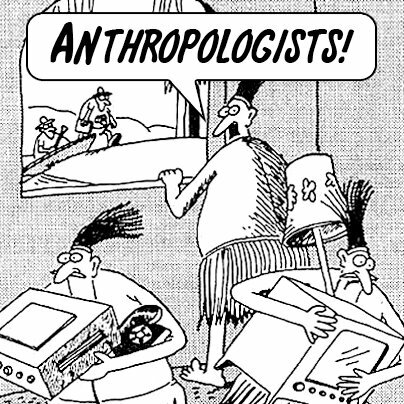 Hey, you are an Anthropologist. That is a great start!